New York University's Anne O'Donnell visited Miami October 10 as part of the ongoing Havighurst Colloquia Series, held each semester on topics of Russian, East European, and Eurasian studies. O'Donnell's presentation, "Seizing Power: Possession and Property in the Revolutionary Republic 1917-1922", explored the nature of material possession in the Soviet Union following the Bolshevik revolution and discussed the concept of ownership and its implications with students. Her talk was the third of a series entitled "Russia in War and Revolution", following lectures by Joshua Sanborn (Lafayette College) and Melissa Stockdale (University of Oklahoma). Those talks explored the ways that the First World War led to the collapse of the old Russian Empire and allowed the Bolsheviks to seize power in October 1917. O'Donnell picked up on these themes by tackling what she termed "the morning after revolution," focusing on how ordinary citizens experienced the conflict. 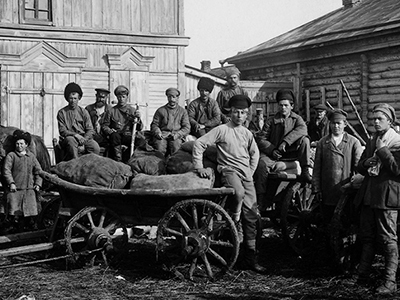 "Dr. O'Donnell's innovative research makes use of previously-closed Russian archives and therefore allows more complex stories to emerge from this period," noted professor of history Stephen Norris in his introduction. Norris is interim director of the Havighurst Center for Russian & Post-Soviet Studies, which sponsored O'Donnell's talk. Taking the stage, O'Donnell explained the context of 1917 Russia by sharing the case of a woman named Tikhobrazova, who returned to her home city of Petrograd (St. Petersburg) for the first time in 3 years only to find that her home (and all of its contents) had been repossessed by several different governing bodies of the new Bolshevik regime. Conflicts like these created devastating post-war confusion, O'Donnell continued, saying, "Famously, the Bolsheviks nationalized means of industrial production, declaring them to be property of the Soviet State…less famously, but on a much wider scale, local governments did the same thing and called it 'municipalization'." Following a revolution that was founded on the elimination of private ownership, citizens were suddenly faced with an entirely new government, which had no practical ideas about how to resolve issues of authority, or what constituted theft, in the Soviet Union. "Caught between its desire to advance the socialist cause, its need for material resources, and its basic inability to stop the practice of possession, the Bolshevik regime allowed confusion about material ownership to fester," O'Donnell said. Chaos ensued for the years during which the Soviet Union disregarded the issue, she added, with looting, 'depossession', and repossession coming to define human value in the new state. During her talk, several students expressed uncertainty in understanding the various groups that played a role in the struggle for power in the unstable Soviet Union, and O'Donnell made a point to provide some clarification. She encouraged them to reflect on their confusion and the helpless feeling that frustrated them as they tried to follow the bureaucratic logic. "This feeling," she concluded, "is just a shadow of the futility that plagued entire families hoping to put their lives back together following the Revolution." Norris added that the "whirlwind of dispossession" between 1917 and 1920 served as a defining experience for those who lived through it. "In the end," he said, "being dispossessed of your stuff helped to make you a 'Soviet' citizen." "Crimes Against Humanity: The Russian Empire and the Entente Note of May 24, 1915"